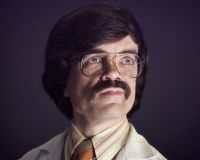 When it was announced a few months back that “Game of Thrones” star Peter Dinklage would be playing Bolivar Trask in the upcoming X-Men: Days of Future Past we all started referring to him as the film’s villain, but that’s not how Dinklage sees it, at least in his portrayal. Not only will Trask be taking on the “mutant threat,” but he’ll have some big human opponents in the movie as well. Many more images of Dinklage in character can be found on the viral marketing site for the film. X-Men: Days of Future Past will land in theaters on May 23, 2014.